An obvious continuation of Anthropophagus The Beast, (in spite of the fact that the main genuine association is star George Eastman played a maniacal savage in that film additionally), Absurd is the story of an everlasting from Greece called Nikos. On the run from his frantic researcher minister, he tears his guts on a spiked wall, and is admitted to an adjacent healing facility. His injuries mend ('its ludicrous' Completely ridiculous') and he goes out of control, yadda-yadda. 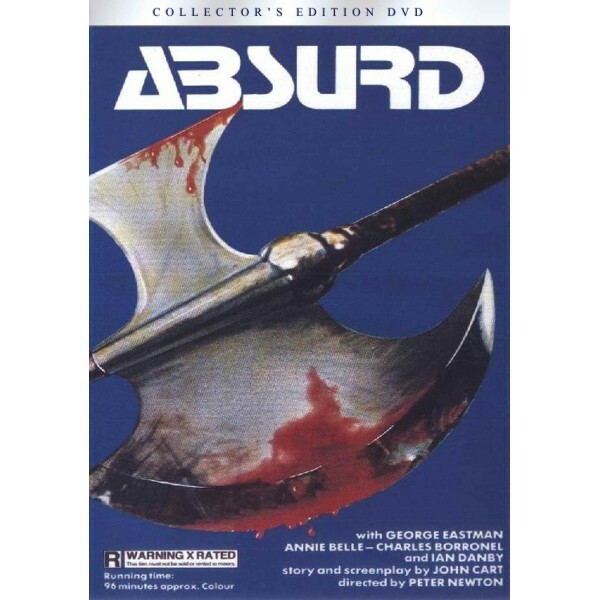 A lot of butchery all through (heads in broilers, demise by band saw, cleaver and pickaxe assaults, eye-gouging) the film at last finishes when Nikos gets a few hatchet strokes to the head. This is one of D'amato's (known as 'one of the top most exhausting Italian chiefs') all the more captivating endeavors, and contains all the pertinent "Awful" fixings: extreme violence (basically like clockwork), dodgy dialog, terrible naming and a straightforward moving plot with able bearing. Incidentally touching on brightness (the eye gouge scene specifically), this film at times feels close to the nature of Halloween or Repulsion. As in Anthropophagus, George Eastman plays a quiet executioner, and a few scenes are particularly twisted (the head in stove scene is extremely protracted and has extra scissor wounds to the neck). This was allowed a dramatic discharge in the early 80s with 2m 32s of cuts, yet Medusa discharged two forms of the film on feature, one cut and one uncut. Both sleeves were indistinguishable, separated from the spine whereby a sticker implied the film was uncut, though a holographic Medusa seal implied the film was trimmed of inordinate violence. Astro movies in Germany discharged 2 diverse DVD's under the titles "Crazy" and "Anthropohagus 2", however these were German dialect just and were both cut.